RIO DE JANEIRO - The head of the World Council of Churches (WCC) has called for joint efforts by Christians and Muslims to "put out the fire" provoked by the publication of cartoons of the Prophet Mohamed. The council's General Secretary Rev. Samuel Kobia said both the violent protests in response to the cartoons and the attempts to justify them as an expression of freedom of speech were wrong. "When it (freedom of speech) is used to humiliate people's values and dignity, it devalues the foundation it is based on," said Kobia, a Kenyan Methodist, speaking at council's assembly in Porto Alegre in Southern Brazil on Tuesday. 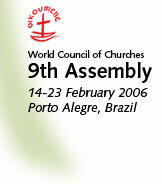 The assembly represents 348 member churches. "Violent reactions, as well as justifying these cartoons as an expression of freedom of speech, continue to put fuel on the fire," he said, according to a WCC statement. Both Christians and Muslims have a responsibility to promote tolerance and address ignorance about one another, Kobia said.